Pastoral Robotics announces lab results indicating DCD equivalence for ournew nitrification inhibitor, NitroStop™. Testing of key components of the NitroStop™ urine patch treatment mix in lysimeters has achieved 70% reductions in nitrate leaching. This is a major breakthrough in the dairy industry’s battle to clean up our water. See the News page for more detail. NitroStop™ is the latest result of Pastoral Robotics’s investment in science to optimize the outcome for farmers and the environment. NitroStop™ is especially formulated to slow the rate of nitrate formation whilst promoting grass growth. 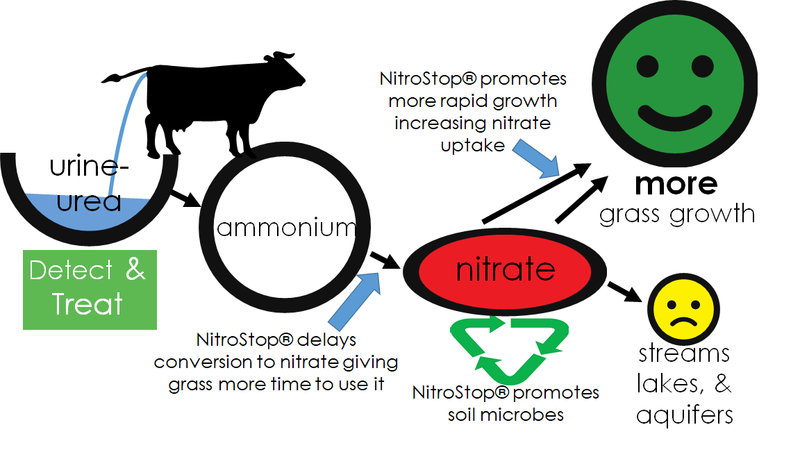 NitroStop™ works by modifying the processes in the soil that transform urea into nitrate - slowing the conversion of soil bound ammonium to soluble nitrate, promoting microbial growth and thus capturing the nitrate for later release and at the same time increasing the rate of pasture growth so that the rate of uptake of nitrogen by the pasture is increased. The outcome of applying NitroStop™ to urine patches is that there is much less nitrate available to leach in the urine effected soil and more pasture to feed animals.